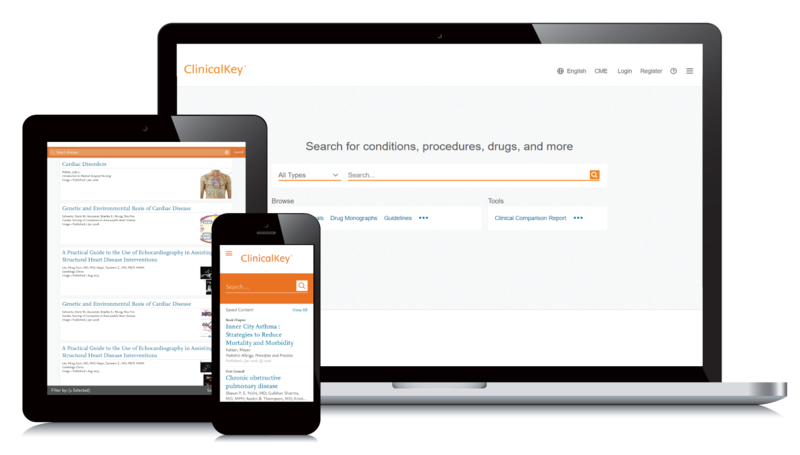 ClinicalKey is an advanced search engine that makes it easier to find and apply relevant knowledge to support your studies and clinical decisions to improve patient outcomes. Whether you are a medical student, intern or practicing clinician, improving patient care and outcomes should be the end goal. With up to 15% of all medical cases in developed countries being misdiagnosed and with the total sum of medical knowledge doubling globally every 73 days by 2020 – it is harder than ever before to keep appraised of the latest developments in your field. More importantly you need to make sense of point-of-care decisions based on the accuracy and relevance of the information you have at hand. ClinicalKey can help with research/studying and practical everyday decisions to drive better care by delivering fast, concise answers when every second counts, and deep access to evidence whenever, wherever you need it. ClinicalKey offers subscribers FREE Internet Point of Care CME credit for self-directed, structured, online learning. Simply create a personal account to start logging your time spent researching in order to claim CME credits. You can print out a certificate showing the time spent carrying out research on ClinicalKey – this can be taken to the appropriate accreditation body and exchanged for CME credits. ClinicalKey is your single source for trusted content covering every medical and surgical specialty. Our content collection is indexed daily and continues to grow as new resources are published, ensuring that every decision you make is based on the most current evidence. Want to learn more about ClinicalKey?